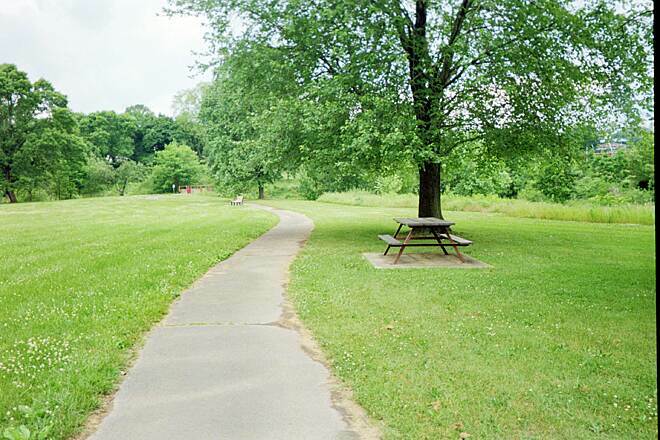 Shade trees provide relief from summer heat in Angelica Creek Park. Taken June 2013. 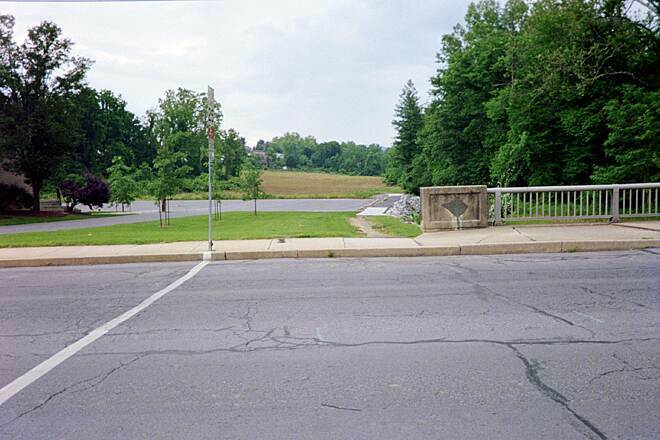 View across the former lake, toward Alvernia University. Looking east in Angelica Creek Park, near Route 10. Passing through the woods east of Route 10. 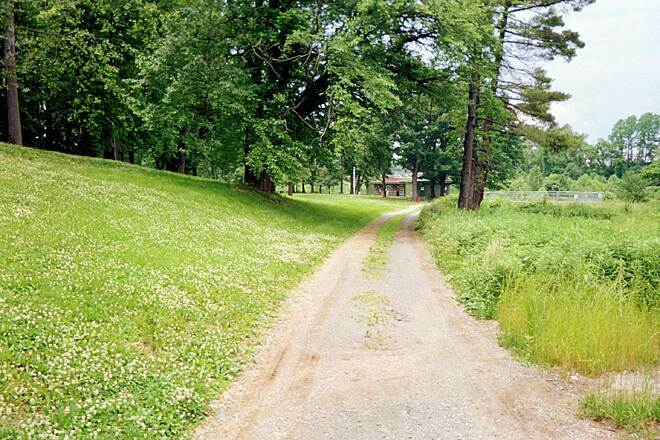 The trail passes through lush woods east of Route 10. 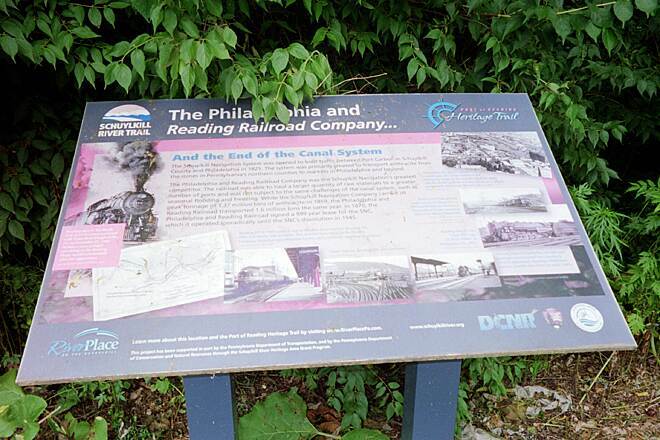 Sign commemorating the history of the Philadelphia & Reading Railroad, located east of Route 10. Taken June 2013. Small dam on the side of the footbridge over Angelica Creek. Looking south across the footbridge over Angelica Creek. 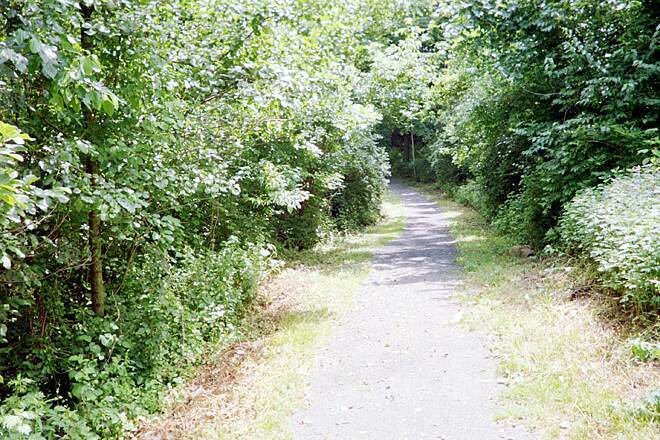 The trail follows the Schuylkill River for a short distance near Brentwood. 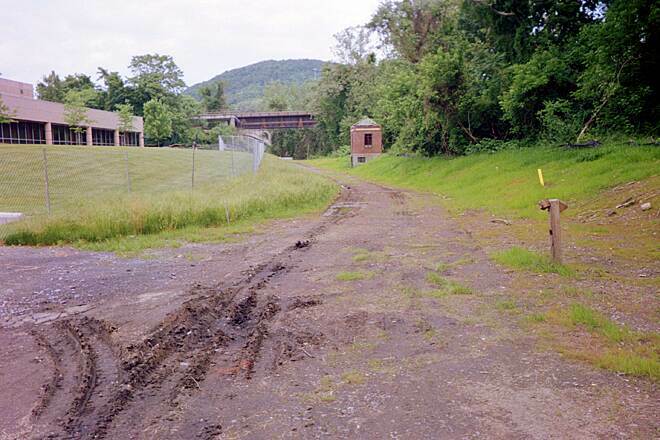 Neversink Mountain can be seen in the background. Taken June 2013. 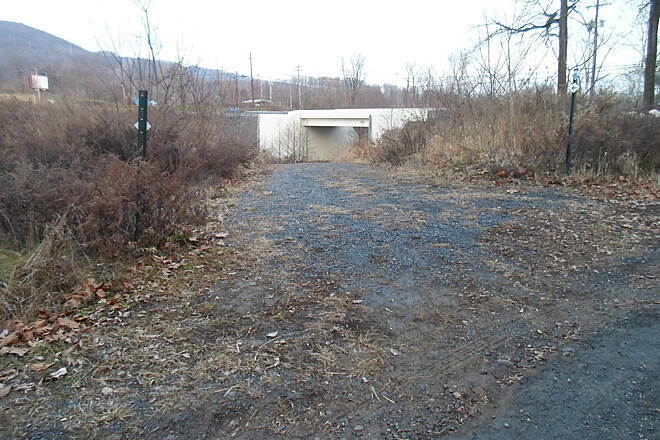 This modern building is just off the trail near the Schuylkill River. Anyone know what it is used for? 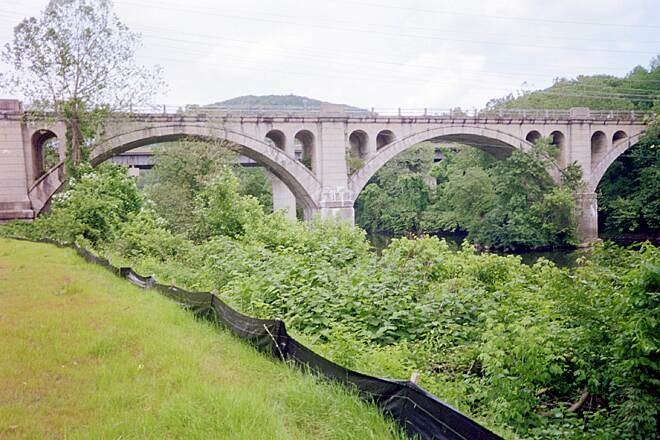 Approaching the trestles that carry the Norfolk Southern rail line (in the foreground) and Thun Trail (see in the background) across the Schuylkill River. 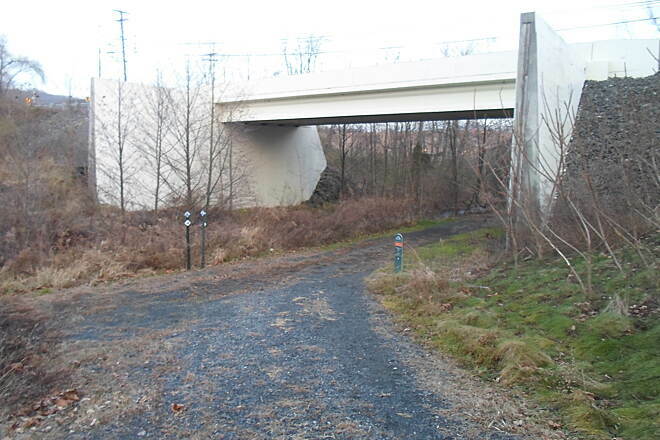 The trestle that carries the Thun Trail across the Schuylkill southeast of Brentwood can be seen near the trail's eastern terminus. 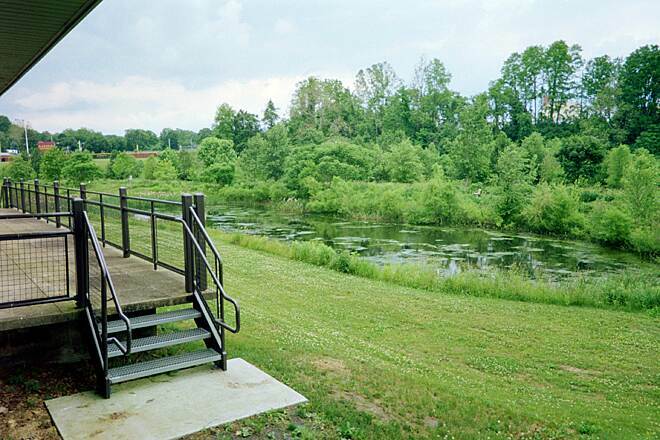 The trail passes under this trestle, then takes a sharp turn, west up the river bank, where it joins the Thun Trail. 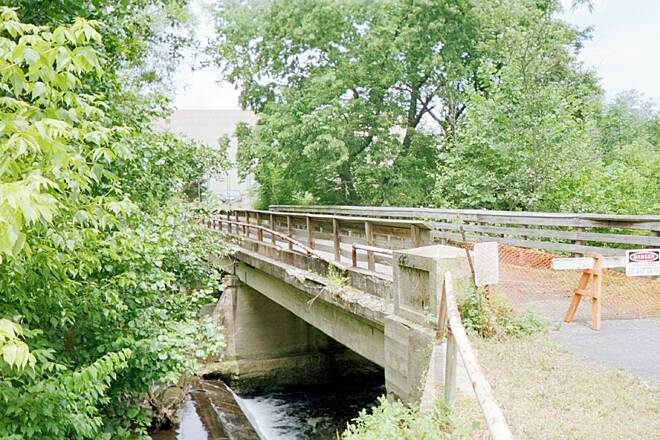 Footbridge across Angelica Creek near the Schuylkill River. Taken June 2013. Passing through the east end of Angelica Creek Park. 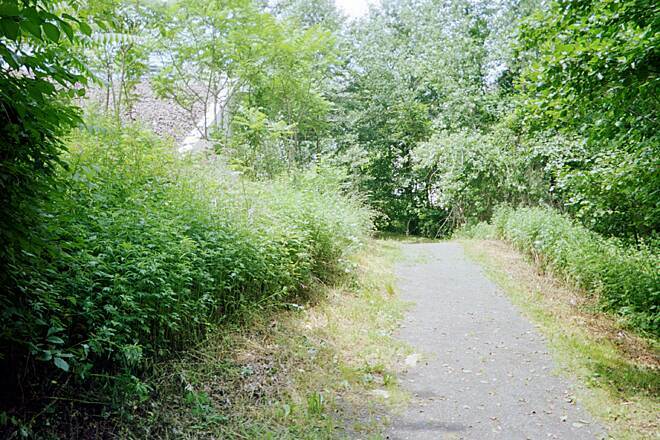 The former lakebed can be seen to the right. 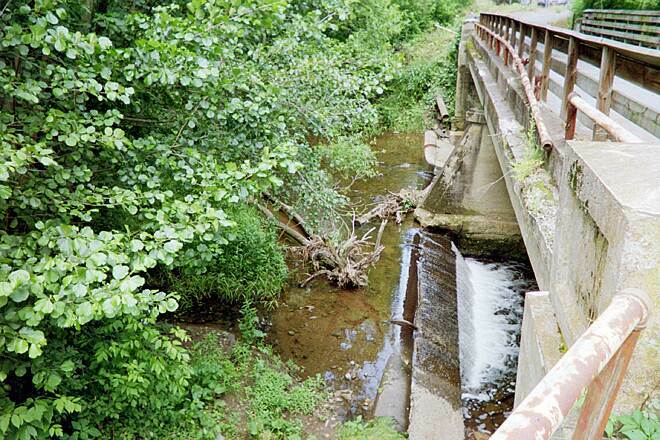 It's hard to believe now, but the middle of Angelica Creek park was once a lake. 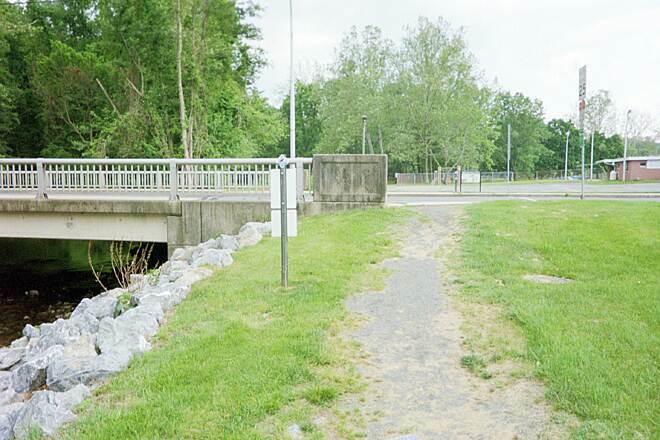 After the dam that once stood on the east end of the lake was breeched in 2001, authorities chose not to rebuild it, and instead allowed the lakebed to revert to a wetland. 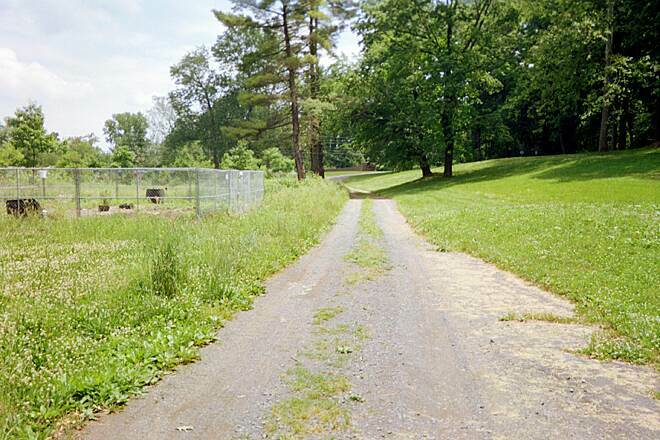 The trail is paved through the middle of Angelica Creek Park, but, like the Neversink Connector Trail, could use some improvements. 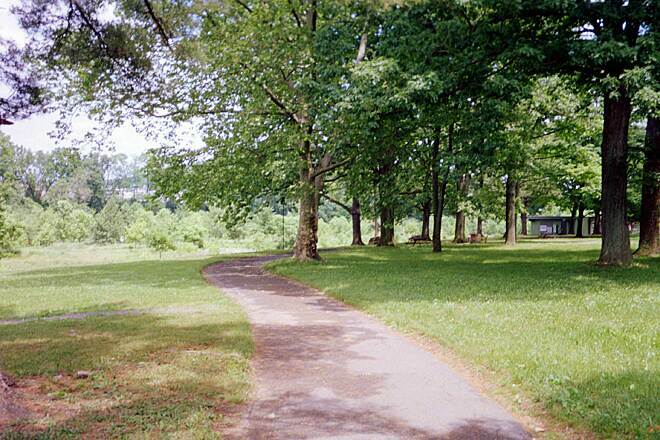 Winding through Angelica Creek Park. Taken June 2013. 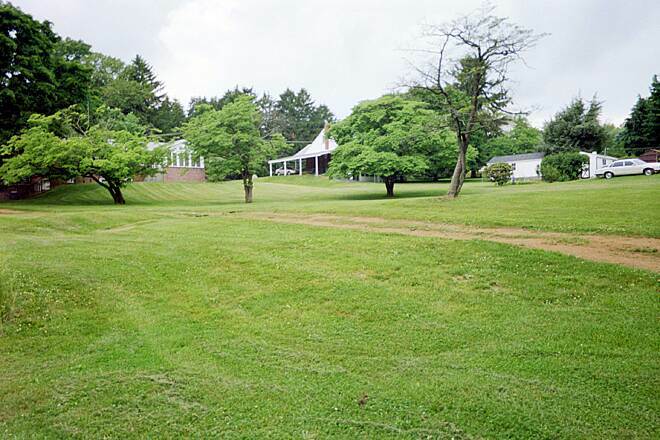 In back of Bernardine Street, between Alvernia Universty and Angelica Creek Park. 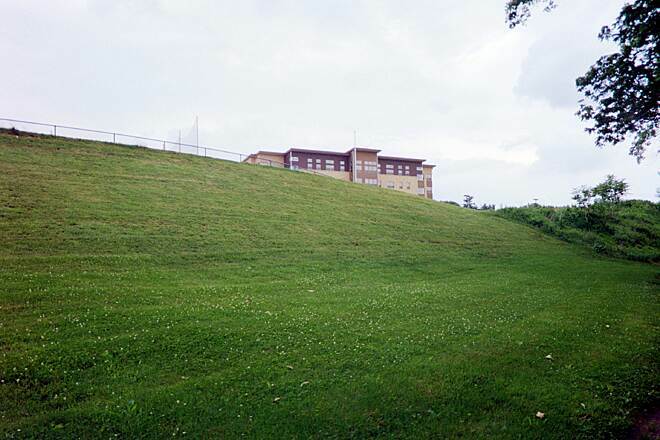 Building on campus of Alvernia University, visible near Kenhorst. 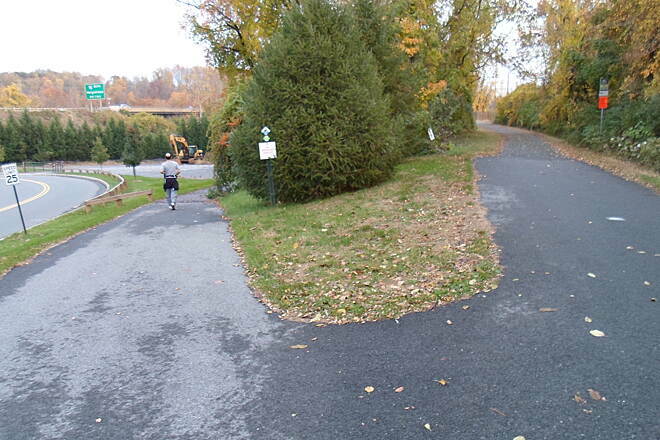 After passing through the Alvernia University Campus, the trail begins a brief on-street concurrency on Wood Crest Drive in Kenhorst. 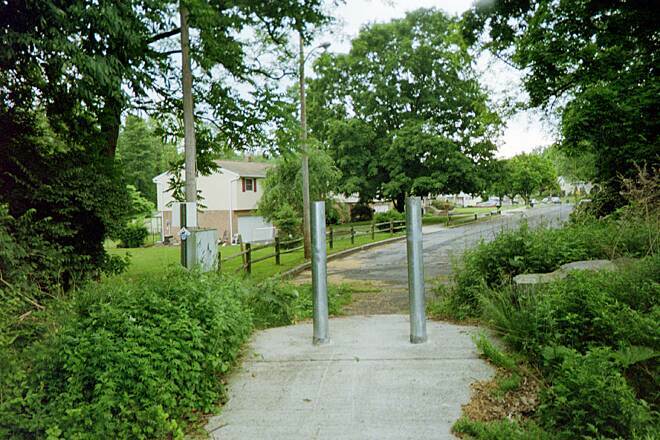 Concrete slope and bollards on southwest corner of Alvernia University Campus. 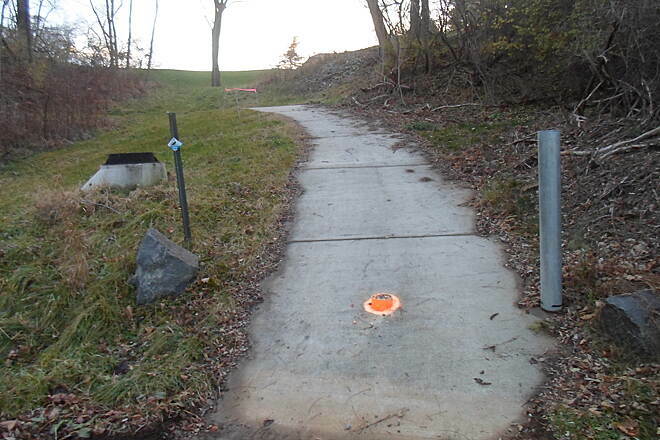 Bicycle users need to use caution on these sections. Taken June 2013. 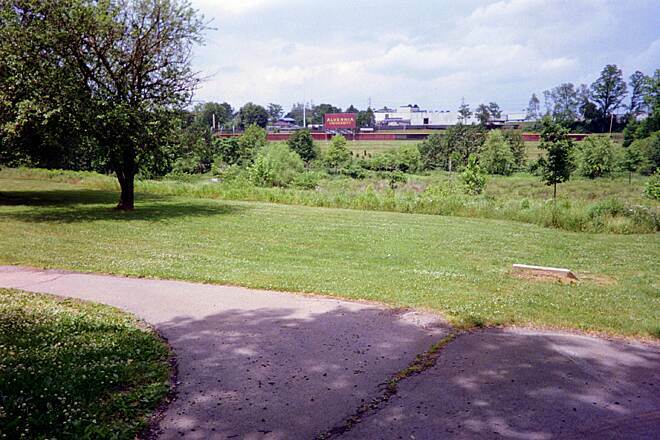 The trail passes through wetlands on the southeast side of Kenhorst. 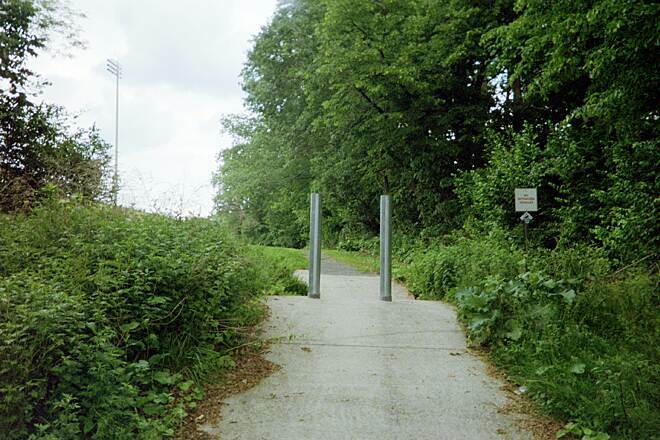 The sign reminds users that the land used for the greenway was donated by local landowners, and people should stay on the trail. Looking northeast onto trail at High Blvd. 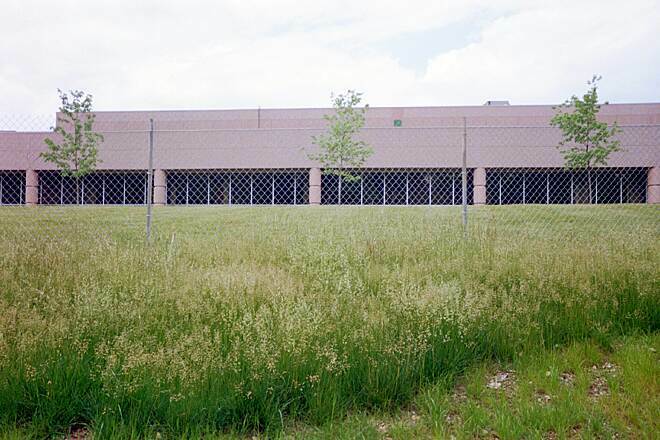 terminus (next to KenGrill Rec. Center). Taken June 2013. Southwest terminus (for now) on High Blvd. in Kenhorst. 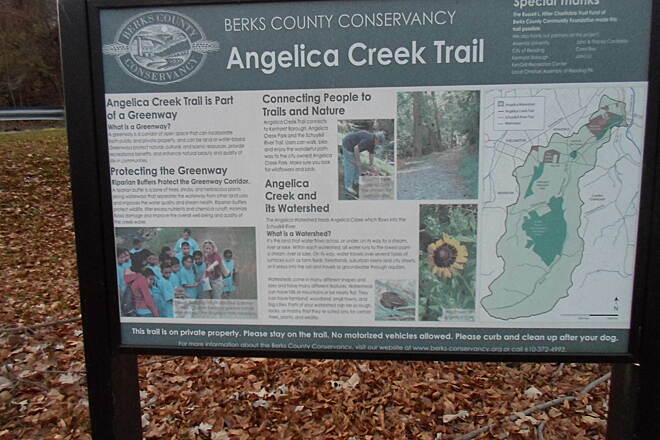 Kiosk providing information on the trail, located in Angelica Creek park near Alvernia University. 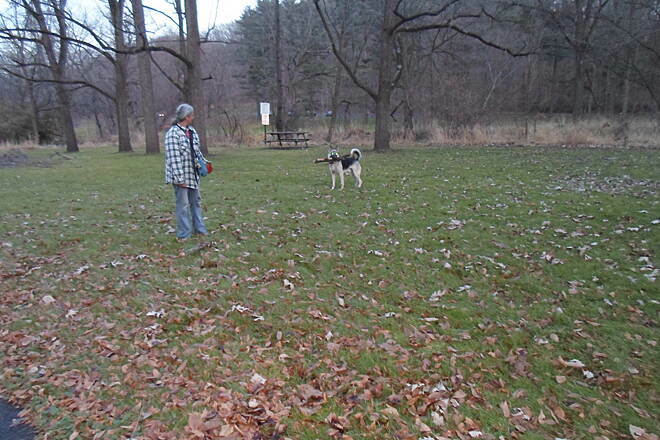 This woman stopped along the trail to play with her dog. 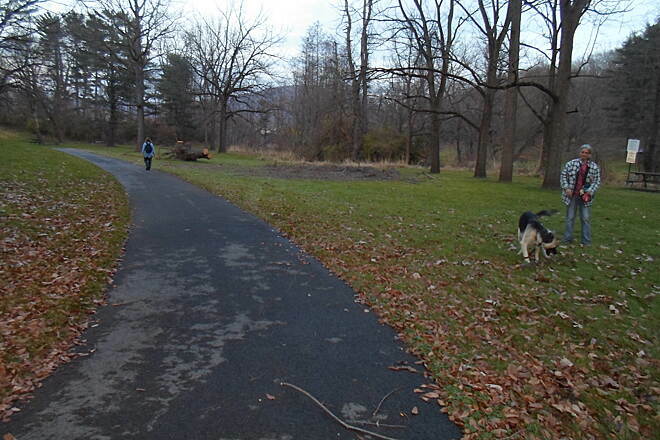 Trail users in Angelica Creek Park, taken on an unseasonably warm day in December 2012. 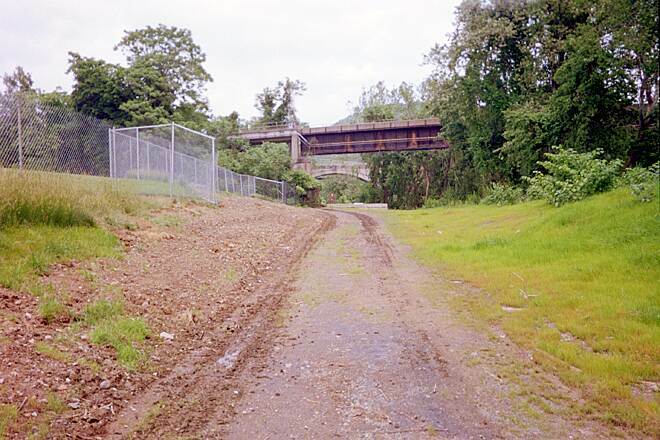 Although its surface is crushed stone or asphalt for most of its length, the Angelica Creek Trail is concrete on a steep slope near Alvernia University. Dog walkers on the trail in Angelica Creek Park. 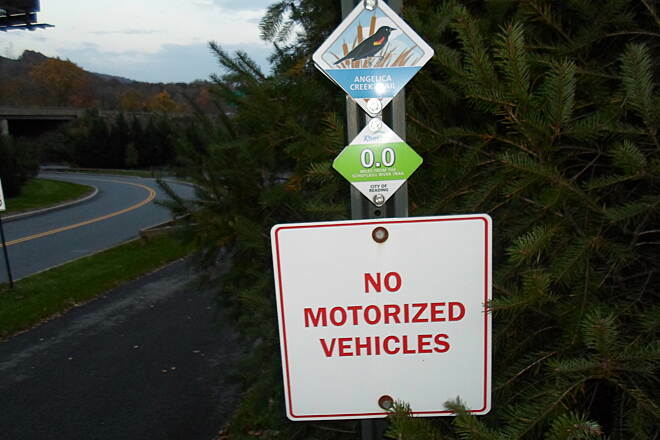 The trail has state-of-the-art mile markers similar to those on the Schuylkill River Trail (Thun Trail) and other greenways in the Greater Reading Trail Network. 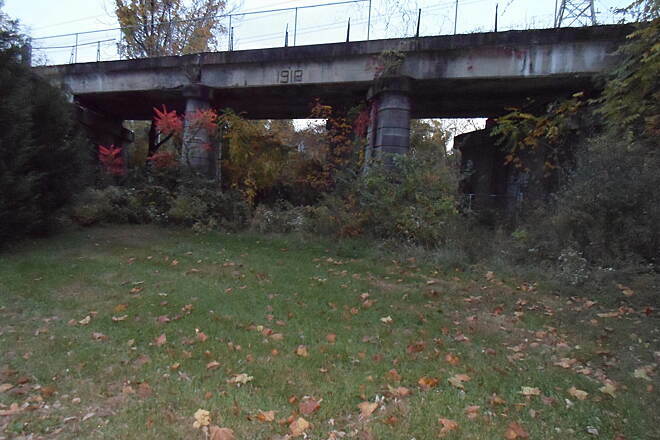 Passing under the Route 10 bridge northeast of Angelica Creek Park. 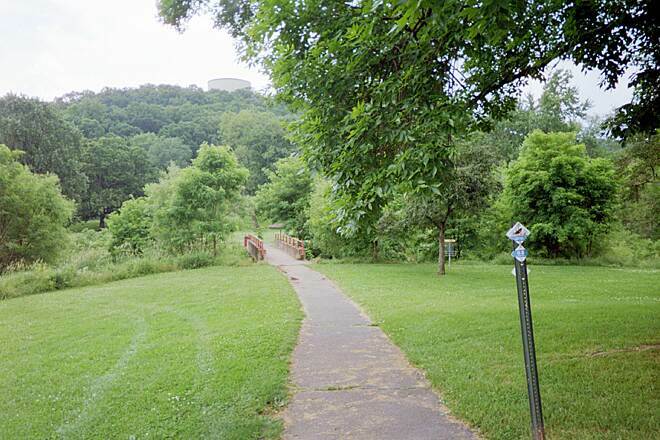 Looking east toward the Route 10 bridge at the eastern end of Angelica Creek Park. 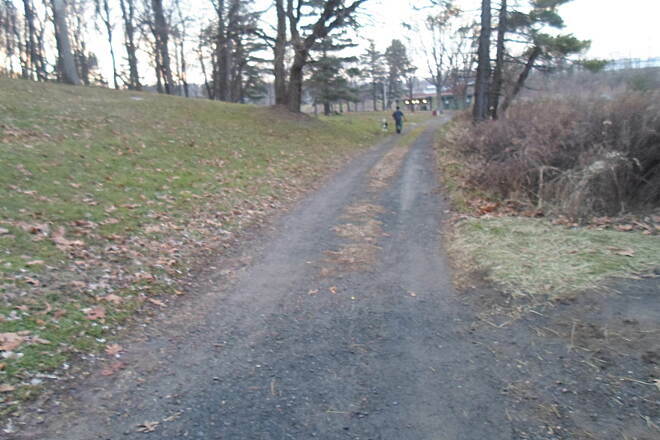 Caution is advised on this section due to steep slopes and loose gravel. 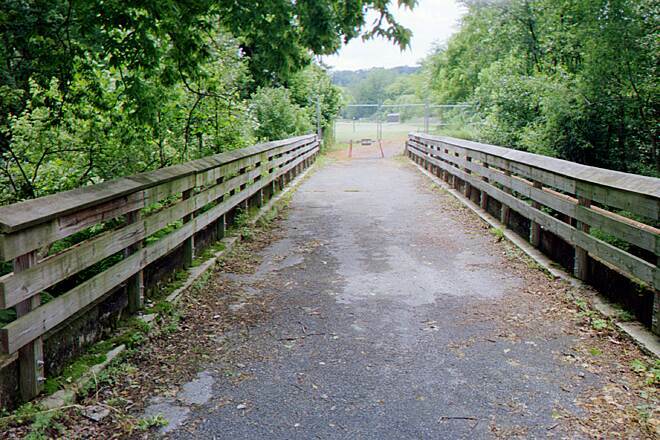 After descending to the water's edge, the trail abruptly turns to the southwest and passes under the arched trestle, heading toward the creek from which it gets its name, and, thence, to Angelica Park, Alvernia University and other nearby points. 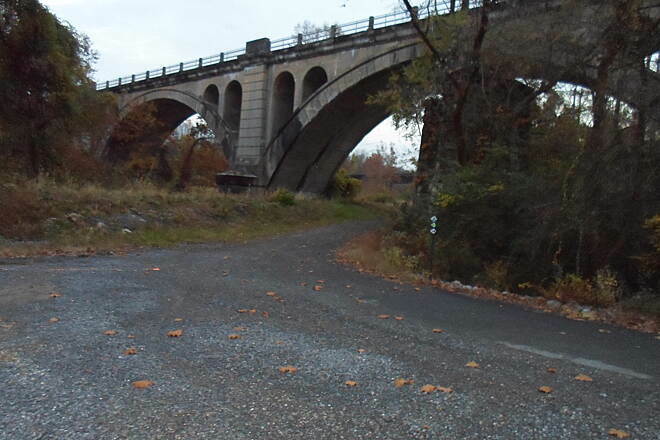 This engraving on the trestle that carries the Thun Trail across the Schuylkill River on the west side of Poplar Neck, and which the Angelica Creek Trail passes under at its northeast terminus, reveals that it is a century old. Sign and mile marker at the northeast terminus of the trail, located at the junction with the Thun Trail immediately southeast of Brentwood. 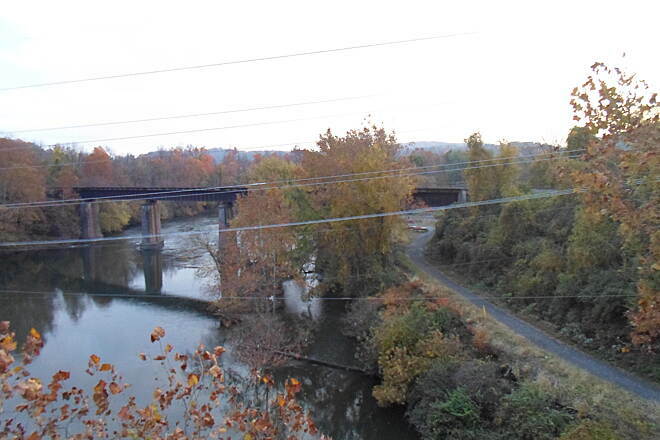 Birds-eye view of the trail, which runs along the right bank of the Schuylkill River, from atop the trestle that carries the Thun Trail across to Poplar Neck. 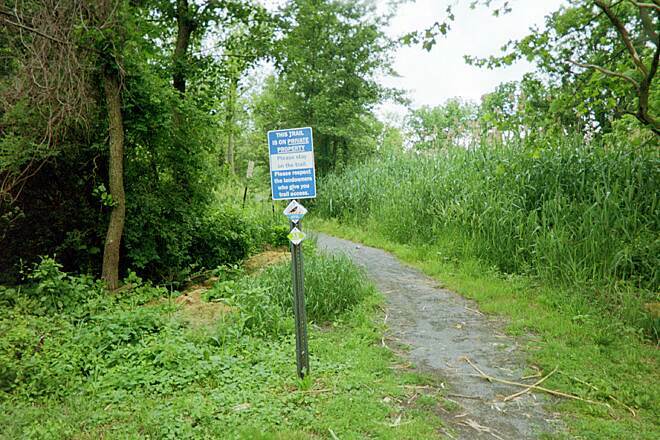 The trail diverges from the Thun Trail section of the Schuylkill River Trail at a point between Brentwood and the trestle on the west shore of Poplar Neck. 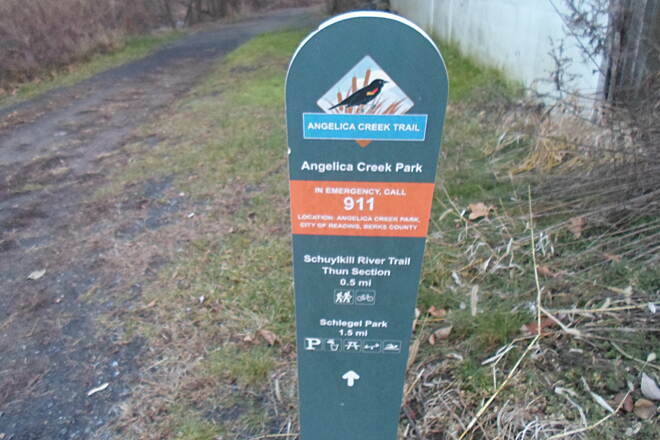 The Angelica Creek Trail goes left, while the Thun Trail veers right.